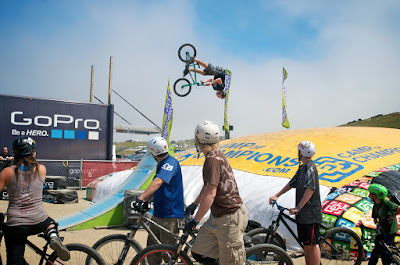 Sea Otter 12: Might As Well Jump! Note the kid in the green helmet who got minimal air (seen in the middle of this photo – bottom right on next two photos). See his reaction to the jump after his and the big air + flip. 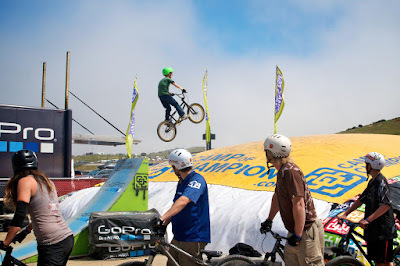 What’s cool about the Sea Otter Classic is that it brings all bike disciplines together into one venue. 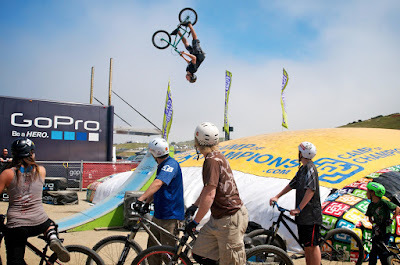 The magic is walking around, seeing new product, meeting Bros, and seeing jumps like this or roadies racing or downhillers bombing a hill. Racing cross too and test riding the Turbo. More photos are lightboxed on G+ and Flickr. Also see video of Raleigh’s new CX bike with discs.